Like the national healthcare industry, the New Jersey health system--once dominated by local community hospitals and independent sole practitioners into the 1960s--has undergone radical restructuring as institutions and providers have consolidated into larger networks. Much of the change has been driven by the need to compete under new reimbursement systems and performance standards established by President Obama's health coverage reform, the federal Medicare program and private sector health insurers. New Jersey health systems, once resistant to entry into the state of out-of-state providers, also have forged alliances with prominent out-of-state systems in attempts to retain patients who previously left the state for treatment at prestigious hospitals in New York City and Philadelphia. In March 2016, Barnabas Health--a seven-hospital system based in West Orange, and Robert Wood Johnson, a New Brunswick-based system with four hospitals--completed a merger combining their 11 acute-care hospitals to form New Jersey's largest health system with 32,000 employees, including 9,000 affiliated physicians and 1,000 residents and interns. The new nonprofit company named RWJBarnabas Health is the second-largest private employer in New Jersey behind only Wakefern Food Corporation, the parent corporation of ShopRite supermarkets. Some three months after the formation of RWJBarnabas Health, in July 2016, Hackensack University Health Network and Meridian Health merged to create the second largest system, Hackensack Meridian Health, with operations in seven New Jersey counties. The new network includes nine acute care hospitals, two children's hospitals and 120 other locations providing ambulatory care, surgical care, urgent care and assisted living services with 25,000 employees and nearly 6,000 physicians on staff. The Atlantic Health System based in Morristown is the third-largest system, with over 14,000 employees and $2.2 billion in annual revenue, comprised of Morristown Medical Center, Overlook Medical Center in Summit, Newton Medical Center, Chilton Medical Center in Pompton Plains, and Goryeb Children’s Hospital in Morristown.. The financial status of some hospitals, particularly those located in older cities with high proportions of charity care patients, remains fragile, and some have closed facilities, curtailed services or sold themselves to larger systems or for-profit firms. Hospitals also have broadened the range of their facilities through ownership of or alliances with rehabilitation centers, nursing homes, fitness centers and hospices. Hospitals operated as for-profit entities also have entered the New Jersey market, often provoking opposition over the higher rates charged for care. Some expanded operations of hospitals, such as in the ownership and rental of physician offices, are currently the subject of legal challenges, including pending litigation by the municipality of Morristown claiming that Morristown Medical Center should not be entitled to a property tax exemption as a nonprofit due to its revenues from for-profit physician practices. A court decision in favor of the municipality led to bills being introduced in the legislature to develop a compromise on the issue for all hospitals in New Jersey remain pending in the state legislature. In its 2019 rankings of the nation's "best hospitals," US News & World Report listed the top three New Jersey acute care hospitals as Morristown Medical Center;: Hackensack University Medical Center; and Robert Wood Johnson University Hospital (New Brunswick). Additionally, the Kessler Institute for Rehabilitation in West Orange was ranked nationally in its specialty of rehabilitation. The New Jersey Department of Health also publishes an annual Hospital Performance Report rating the state's hospitals on selected performance categories in patient safety, hospital-associated infections and treatment of cardiac, pneumonia and surgical care. In its most recent report published in 2015 based on 2012 data, New Jersey hospitals performed better on patient safety categories than the national average on seven of ten measures, but were worse than the national scores for post-operative hemorrhage or hematoma and post-operative pulmonary embolism or deep vein thrombosis. State hospitals performed at or better than national averages in five of six hospital-associated infection measures. The Leapfrog Group, a nonprofit established in 2000 by major national employers to improve information on hospital safety, quality, and efficiency based on comparative performance measures, conducts an annual survey to allow purchasers of health care to structure contracts and purchasing toward the highest performing hospitals and provide consumers with information on hospital safety and quality. New Jersey hospitals ranked fifth in the nation for successfully preventing errors in Leapfrog's most recent survey. In 2015, the Leapfrog's annual award recognizing hospitals in New Jersey exhibiting excellence through their performance on combined safety, quality and resource use standards was given to Englewood Hospital and Medical Center; Hackensack University Medical Center; Saint Barnabas Medical Center; Virtua Voorhees Hospital; and Children’s Specialized Hospital. The Dartmouth Atlas, which for the past 20 years has been comparing the cost and quality of healthcare around the nation, found in its most recent review that New Jersey is a high-cost state for hospital care, but isn't achieving commensurate health outcomes. New Jersey had one of the highest rates of hospital re-admissions within thirty days of discharge, averaging over 16% for medical admissions and 13% for surgical admissions, according to a report based on 2010 data published in 2013 by the Princeton-based Robert Wood Johnson Foundation. In response to the report, hospitals with high levels of re-admissions contended that the study did not adequately take into account the conditions and ages of patients. Other ratings and rankings of hospitals are published by the federal Medicare program and private publishers such as Castle Connolly Medical Ltd. and Consumer Reports. 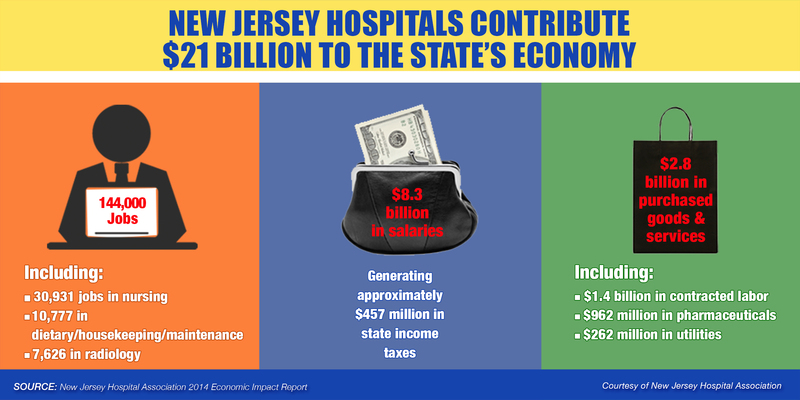 The annual economic impact report published by the New Jersey Hospital Association, the trade association representing most of the state's hospitals, estimated that in 2014 hospitals accounted for some $21 billion in the state economy, including $8.3 billion in salaries and $2.8 billion in purchases of goods and services. The Association calculates that they provide $2.6 billion in charity and other community benefits and more than $20 billion in economic benefits. In 2013, $2.2 billion in unpaid costs of patient care, which includes $550 million in charity care services not reimbursed for the working poor, $364 million in unpaid care for Medicare patients and $123 million in unpaid care for Medicaid patients. This amount also includes $1.2 billion in uncollectable costs for treatment, also known as bad debt.In addition, many hospitals make voluntary cash contributions to their host municipalities, or make in-kind contributions like donating ambulances. Medicare's most recent periodic inspections of the state's nursing homes--typically done in 2014 or 2015--reported 2,027 problems found at 364 New Jersey nursing homes that accept Medicare and Medicaid, somewhat lower than the 2,113 deficiencies found during the prior round of inspections. According to the survey, the average New Jersey home has 4.3 problems related to residents' health and 1.7 related to fire safety. Both of those averages are lower than the national rates of 6.8 health deficiencies and 3.3 problems related to fire safety. Most of the deficiencies found were considered to be mild, with only 2% ranked among the most severe which could risk the health of residents.The number of deficiencies varies widely in the state, from none over the past three inspections at Emerson Health Care Center in Bergen County to 57 at Atrium Post Acute Care of Lawrenceville in Mercer, according to an analysis of the data. New Jersey enacted legislation in 2010 to allow the legal sale of marijuana for designated medical purposes. The legislation and its implementing regulations, however, were criticized as overly restrictive, thus preventing many potential users from participating. During his gubernatorial campaign, Phil Murphy endorsed expanding the medical marijuana program, as well as seeking legislative approval for recreational use. In Murphy's first year in office, the state increased the number of medical dispensaries from six to twelve and the legislature began debating bills to allow licensed recreational sales. The legislature was continuing to consider marijuana legalization bills in the spring of 2019.